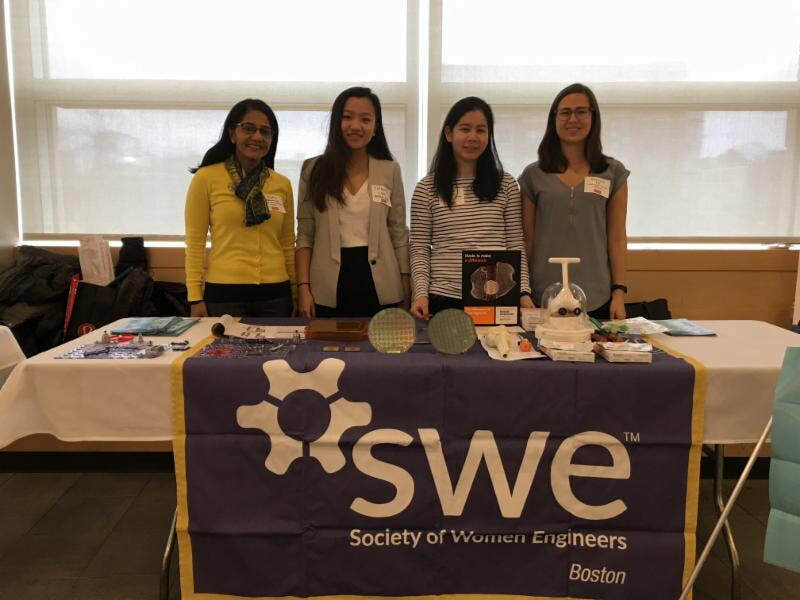 ​On Saturday April 7th, 2018, SWE Boston hosted a table at SET in the city's science information bazaar at Boston University. This was part of a 1 day event for 150 girls from all over the Boston area to explore careers in Science, Engineering, and Technology put together by a consortium of universities. Other exhibitors included representatives from universities, corporations, other organizations like SWE. SWE members Tulika Hainsworth, Cindy Tritton, Tiffany Law, and Juliana Lee put together our table with items from their careers in Integrated Circuits, Orthopedic surgery, and the Pharmaceutical industry. During the bazaar, they engaged the students as walked around the exhibits using SWE brochures that described different branches of engineering. The students were really interested learning about the different areas that the SWE members had worked in and interacting with the "show and tell" items and the snap circuit kits. Our table was surrounded by clusters of students throughout the event.